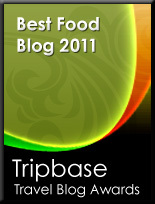 Breakfast is not the meal given the most attention here at Enjoy Food & Travel. Still having a substantial meal at the start of the day will give you something to go on - at least until lunch!! That is vital to the busy tourist set to explore the back and belly of a metropolis as Barcelona. El Fornet d'En Rossen served such a great meal at an unbeatable price (€14 for two). 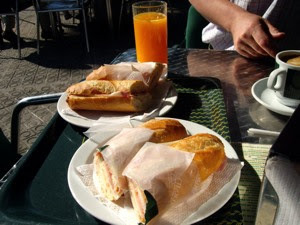 "Bocadillo con queso et jamon, cafe con leche" and fresh pressed orange juice and then go outside and sit down enjoying the hot Spanish morning - nothing could be better. And of course you get instant satisfaction by the fact that the people around are on their way to work - and you are not. Ah! Vacation!! This meal effects the digestion system of a northerner. Most Norwegians enjoy bread with fibre made from wheat, barley, or rye with cheese, ham or paté - or have a large bowl of müesli with milk. I prefer the former variety. I discovered, to my surprise, that many Spaniards preferred sweet pastry, croissants or biscuits for breakfast, with a coffee with milk. I remember I did make a remark on just this to Øivind Grimsmo ands his Spanish wife Monica, and they confirmed that Spaniards are not into breakfasts as we Northerners are. Very strange that there are so few obese people in Spain, when they start with pastry made from butter, flour and sugar. Equally strange that there are so many obese people in Norway when they start their day with such a healthy and fibre rich diet. Genetics? I do not know. 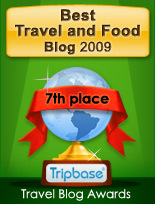 Summer of 2007: O Barcelona! O Catalunya!